About fourteen  individuals were honoured for their various contributions to student life at Marshalls at the first Awards and Dinner Night put together by the Marshalls Association of Student Affairs [MASA] to celebrate students, faculty members and administrative staff of the Marshalls community who had distinguished themselves in their various fields of endeavor. 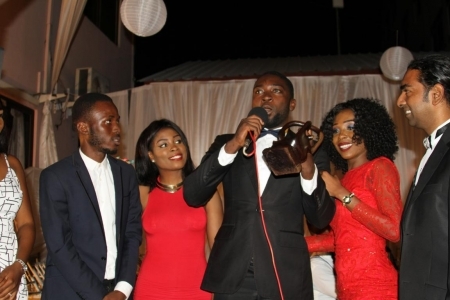 The MASA Awards Night and Dinner 2017, on the theme “Awarding the Deserving”, was held on the Forecourt of Marshalls’ Odorkor Campus. It was a night of colour and grandeur as participants, appareled in graceful tuxedoes and dinner wear, arrived to a warm red-carpet reception and photo shoot. There was much to eat and drink as attendees feasted, chatted and danced away the night. There were also stand-up comedy and music performances from some aspiring student entertainers and the impressive Marshalls Music Club. As a matter of fact, every aspect of the event, including sound, stage, food, lighting and music was done in-house by students of the institution, with most contributors leaving the event with an award or two for their various contributions par excellence over the years. Amongst the numerous categories were overall best student, student entertainer of the year, sports personality of the year, entrepreneur of the year, student representative of the year, innovationist of the year [IT], Media personality of the year, student organization of the year [best group], writer/ blogger of the year, Personality of the year amongst many others. Two special awards were also given to recognize the achievements of the most outstanding lecturer and administrative staff of the college.